So this fried rice? Delicious! It has big chunks of veggies and most importantly, MEAT! I haven’t had a ton of fried rice in my day but it seems like the meat that’s in it is irrelevant, and I’ve never understood why people even care if it’s chicken or pork or shrimp or vegetable. It all tastes the same. But not this stuff! There are big chunks of meat. YUM! And while I’ll have to say I have, on occasion, found the fried rice at some of those Japanese grills (like Sal’s) to be better, I’ve also, at least half the time, thought their rice is way too salty. This stuff wasn’t. Plus, I didn’t have to sit through an awkward show, or pay a LOT more. Yes, there’s a time and place for a Japanese show, I am just not a person who particularly enjoys them. Which is why I have Emperor’s Grill on my list of restaurants to try. OK, this is turning in to a Japanese grill bashing. Really, I get that some people like them and they’re a splurge. And they have the BEST chicken. Possibly in Wichita. And the soup is yummy, too. So this is my last bash (in this post). Back to the point. 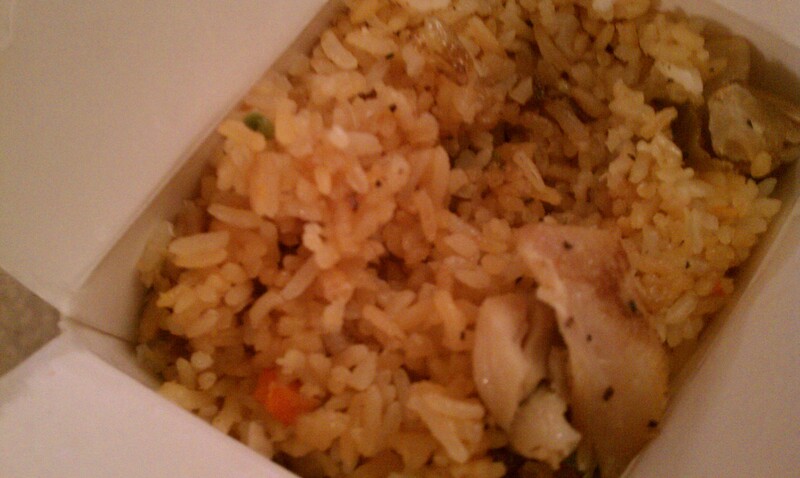 The fried rice was so good. 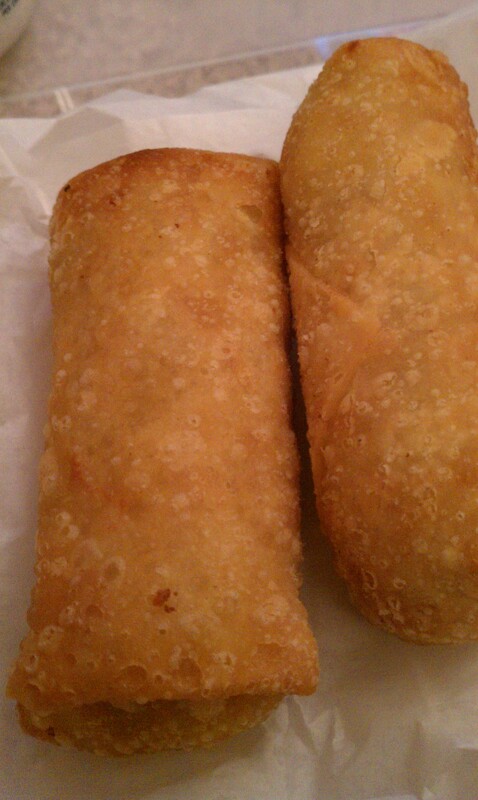 And the eggrolls were awesome, too. My only complaint was that they don’t have sweet and sour sauce. I love dipping an eggroll in sweet and sour sauce. And when I asked if they had any, I thought the lady behind the counter, Mrs. Fried Rice if you will, was going to slap me across the face for being blasphemous. But shortly before my sweet and sour sauce inquiry another group walked in and Mr. Fried Rice, the guy cooking, comes up and says “Where the hell you been!?! ?” And it frightened me a little, but apparently they were bros. Because everyone laughed. Damn, I need to stop being so sensitive. Yelling makes me uneasy. I can’t help it. I’m not a fan of loud noises unless it’s music in my car. Anyway, bottom line, go. Order “the special” (I know chicken and pork are options, can’t remember if there’s a seafood option). Pay your $4. Oh! And the special come with a can of pop. I mean, really. Find me a better deal than that in Wichita. And someone who will yell profanities at you for free! I kid. I kid. Well, I don’t really kid, but it appears they only curse at their regulars. I wish I were a regular. I know it’s lame, but the fact the rice came in a box rather than those dumb styrofoam containers everyone uses made me happy. Hey, I’m easy to please! Oh, and you guessed it. All this fried perfection was paired with a can of diet pop! I’m a cliche. I love it. 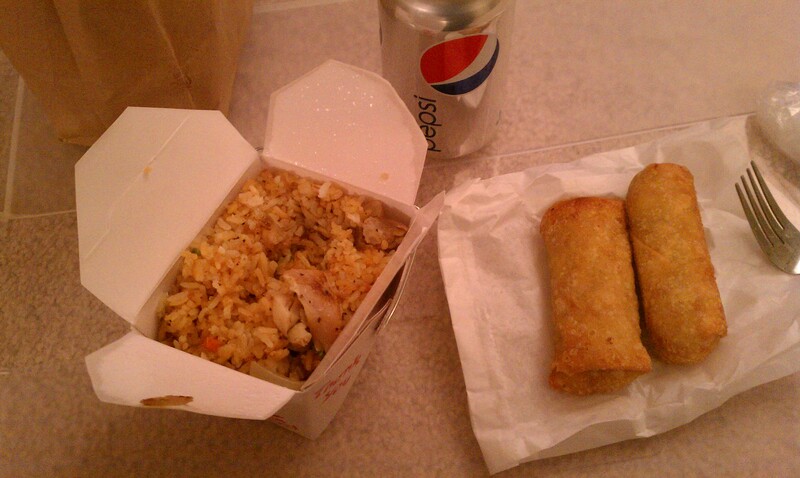 Mmmmmmm… Luckily for me (I took my order to go), I had some spring roll dipping sauce at home. Which is very similar to sweet and sour. Hey Charlie Sheen, this is what WINNING really looks like. Very introspective. But it’s even more simplistic, I hate being the center of attention. And shrimp. So the embarrassment due to lack of skills is only a bonus. Tri-losing?